Subwoofer Placement : Audio Design Labs Inc.
Every acoustic space is unique and experimentation is an important key in finding the best possible location in your particular environment. A subwoofer becomes more acoustically efficient (has greater output) as you move it closer to a room surface (e.g. wall or floor). A subwoofer will give maximum output and maximum acoustic excitement when it is located in a corner. Under certain acoustic conditions corner locations are optimum; in others they can excite multiple “room modes”, producing “muddy” or “boomy” sound. The following methods have been found to work successfully under most conditions. These methods assume that you are using a single subwoofer in your room / studio. For information on placing multiple subwoofers, please follow this link to the “Sound and Vision” website. The first method described below doesn’t require any special test equipment. It does require a pair of good ears and familiar broad-spectrum music material – recordings with lots of energy across a wide frequency range (from low to high). The recordings should be highly dynamic and be the highest possible quality. The second subwoofer placement method requires using a real time analyzer – such as those made by Gold Line™ or The Audio Toolbox(TM) by TerraSonde(TM), or a free software tool such as the “Room EQ Wizard“. Although many home audio enthusiasts may not have access to this equipment, if you are having a sound system or home theatre system professionally installed, this information may be useful to the installer. Place the subwoofer at the main listening, play a CD or other music source and make sure that the level of the subwoofer has been raised high enough so that low frequencies are not masked by the background noise in the room. Once you have roughly balanced the level, between the sub and main speakers, move around the room and pay careful attention to where the spectral response is smoothest and has the greatest low frequency extension, pay special attention to the corners and along the walls. Also, make sure to pay attention to where the system has its greatest impact and definition. You are not just listening for the most boom, but rather where the bass is most accurate and natural sounding. Remember, because the subwoofer is basically omni-directional, the best spot for the subwoofer may be next to, or even behind, the main monitoring area. After finding the spot where the subwoofer has the best response in the room, place the subwoofer in that location. Now, listen from the main position and confirm that the subwoofers response is similar to when the positions were reversed. If it is, then leave the subwoofer in that location. If not, continue to experiment with the subwoofer location until the most accurate and best response has been achieved. Subwoofer placement using a real time analyzer – Such as those made by Gold Line™ or The Audio Toolbox™ by TerraSonde™, or a free software tool such as the “Room EQ Wizard“. As you move the microphone around the room, be sure to pay careful attention to where the spectral response is smoothest and has the greatest low frequency extension, pay special attention to the corners and along the walls. Again, it is important to remember that because the subwoofer is basically omni-directional, the best spot for the subwoofer can be next to, or even behind, the main monitoring area. After analyzing the data and finding the spot where the subwoofer has the best response in the room, place the subwoofer in that location. Now, take some additional measurements from the listening position and confirm that the subwoofers response is similar to when the positions were reversed. If it is, then leave the subwoofer in that location. If not, continue to experiment with the subwoofer location until the smoothest and best response has been achieved. It has been found that a subwoofers’ in-room response can sometimes be improved by facing the drivers toward a wall. Again, experimentation is the key to finding the best possible location. 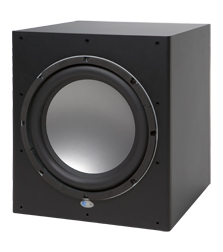 Properly designed subwoofers generate tremendous energy, so they may vibrate objects close to them. If you hear buzzing or vibrating objects, make sure to try and dampen those objects. Rattling, buzzing and other sympathetic resonances can make the subwoofer localizable and therefore should be avoided. Using a sine wave generator can be helpful in locating these acoustic anomalies.